Stabi-Craft’s 659 SC (Super Cab) was released last year to join the larger 759 SC in the company’s premier range of offshore-capable trailer boats. It differs from other Hard Top models in that the wheelhouse/cabin superstructure is constructed in aluminium alloy rather than moulded GRP. Paul Smith reports. The style of the SC superstructure is a little more edgy, but alloy construction allows greater versatility and durability. Another feature of the SC range is the greater internal space afforded by the pontoons being formed as part of the cabin sides rather than being the basis for the exterior walkways in the other Hard Top models. 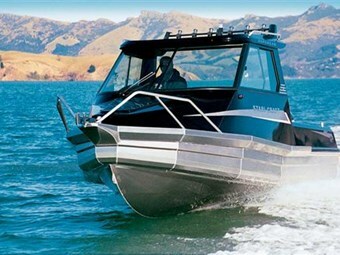 The Christchurch dealer for Stabi-Craft Marine Ltd is Powerboat Centre Ltd. The 659SC it provided for review was resplendent in its shiny black painted topsides highlighted with metallic silver graphics and Nyalic treated hull. It had been spec’d up a little and had a Yamaha 150HP four stroke outboard motor bolted to the back. The boat sat on a tandem axle, galvanized steel Watercraft multi-roller trailer with hydraulic over-ride disc brakes fitted to the front axles. We headed for Lyttelton Harbour on a balmy autumn morning eager to make best use of a perfect day for boating. 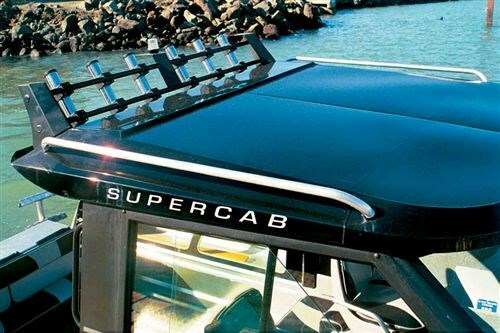 With a trailerable weight of around 1500kg, the Stabi-Craft 659 SC was well within the towing capability of the Powerboat Centre’s Mitsubishi Pajero and therefore most large cars and mid sized 4WD vehicles. While launching was completed, I took the opportunity to look over the vessel. This particular example of the Stabi-Craft 659 SC featured an open wheelhouse giving a seamless transition between the cockpit, helm and forecabin. While the internal ceilings and walls of the wheelhouse and forecabin are lined, the treadplate alloy sole remained bare and other alloy surfaces such as the helm station were painted or Nyalic treated. This is consistent with the no-nonsense, rugged, fishing/diving use that the majority of purchasers of this type of vessel expect. Designed primarily as a day boat, the Stabi-Craft 659 SC does not provide sleeping accommodations. The forecabin has a vee berth providing comfortable sitting space with good storage under, but with the exception of children, is too short for reclining. The sides and ceiling of the cabin are lined as are two, deep parcel trays, but surfaces below the seat squabs are unpainted alloy. A large hatch provides light, ventilation and easy access to the deep, self-draining anchor locker. A Sarco stainless fairlead is attached to the strongly constructed alloy bowsprit and these combine with the solid alloy bollard for anchoring and mooring duties and these can all be readily accomplished from the hatch. If necessary, access to the foredeck is provided by the external walkway running around the outside of the pontoons from the wheelhouse toward the bow. 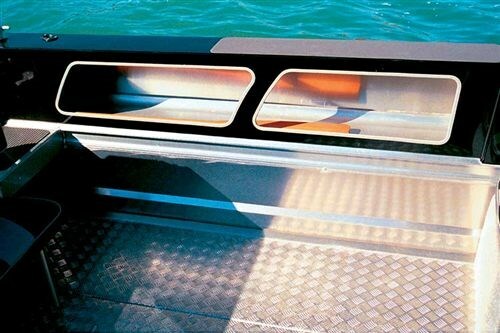 The walkway has a non-slip coating while strong alloy grab rails are located on the wheelhouse roof with a split alloy bow rail protecting the foredeck. The wheelhouse itself provides plenty of visibility with the large curved windscreen and sliding side windows. This, combined with the absence of bulkheads separating the forecabin and wheelhouse, imparts a strong impression of space and freedom of access from one end of the vessel to the other. The helmstation is mounted on a hanging binnacle to starboard and is formed in painted alloy. Three Yamaha digital gauges monitor a variety of functions: From left, the speedometer also displays readouts for trip, time, battery and fuel tank. The center displays fuel useage and management, and to right the tachometer also displays engine coolant temperature, oil pressure and engine trim position. A gang switch panel controls navigation lights, riding light, bulge pump operation, wiper, cockpit lighting and a spare. A single wiper serves the windscreen ahead of the helm. Sea Star hydraulic steering is actuated by a soft-feel wheel while the Yamaha 704 remotes are mounted on the starboard coaming. Placement of both the wheel and the remotes is comfortable whether standing or seated. To port, a stainless steel grab rail is mounted on top of the lined dash top. In the review boat, King/Queen seating is provided both sides. The helm seat is adjustable for’d and aft as well as up and down. The plastic bases provide heaps of storage under. The seamless blending of cockpit and cabin space makes for a workable platform for fishing and diving. The cockpit coamings are high and wide although the pontoon style does not facilitate toe holds for fishing. Nevertheless, there is plenty of support at thigh height. The coamings also have two large storage ports either side atop the pontoons to handle fishing gear, dive bottles, gafs, boat hooks, paddles etc. There is a rod holder aft on each coaming just for’d of a solid alloy bollard in each corner. Other rod storage is provided on the six unit rocket launcher mounted on the rear edge of the wheelhouse roof. The transom has a walk-through on the starboard side (looking for’d) to the boarding platform. On the port side, a folding seat provides comfortable accommodation for two adults or three children. Two SoPac hatches access sealed lockers in the transom for the battery and other items off the floor, while fish bins fit neatly underneath. The fuel filler for the 200 litre (280 litres optional) underfloor fuel tank in centrally located on the transom. The boarding platform is strongly formed in alloy and treadplate and also features a folding boarding ladder the design of which allows easy access by divers wearing fins. The centre of the platform is supported by Stabi-Craft’s Superpod outboard mounting system. This provides additional buoyancy for the mounting of larger and heavier 4 stroke outboard motors. The outer edges of the platform are secured with strong alloy grab rails. Stabi-Craft Marine Ltd has provided the 659 SC with a power rating of 130 – 200HP, outboard only in either single or twin engine installations. Powerboat Centre fitted this example with a single Yamaha 150HP four stroke engine, the F150AET. At the lower end of the rating for this vessel, the 2.7 litre, DOHC, four-cylinder Yamaha neverthelsss has enough grunt to push the 659 SC along comfortably and within reasonable fuel consumption parameters. In calm water conditions, lightly loaded and with the outboard motor set at half trim, the Stabi-Craft 659 SC cruised comfortably at 4000 rpm with 44 km/hr indicated on the speedo and fuel consumption averaging 23.8 l/hr. Step this up to 4500 rpm, speed increased to 50 km/hr and fuel consumption to 27 l/hr. At 5000 rpm, speed increased to 57 km/hr and fuel consumption to 35.8 l/hr. When the throttle was opened further to 5500 rpm, speed increased to 63 km/hr, while fuel consumption climbed to 44.2 l/hr and at Wide Open Throttle with 6000 rpm showing on the tachometer, speed was recorded at 71 km/hr and fuel consumption peaked at 58.5 l/hr. We headed out to the heads of Lyttelton Harbour hoping to find some water that might test the Stabi-Craft 659 SC. We were not successful. The rolling 1 – 2 metre swell and minimal wind chop were handled with disdain, the 659 SC delivering up a comfortable and dry ride. The only criticism to levied at the boat was the high level of water noise emanating from beneath the pontoons as the craft powered into the swells. This may have been enhanced a little by the open nature of the wheelhouse and the bare alloy surfaces, but is likely to be viewed by potential buyers as a small price to pay for the reassurance and stability offered by the 2450 litres of reserve buoyancy incorporated into the design. The boat tracked very well and responded nicely to helm inputs. It is the type of boat that inspires confidence and had time permitted, we would have happily headed out to the groper hole some 40 miles off – if we knew where it was! The Stabi-Craft 659 SC is not, in my opinion, the most stylish trailer boat ever designed but I do find the purposeful, functional stance of the vessel appealing. It looks tough, and it is. Concessions to comfort in the boat supplied for review include the King/Queen seating and the fold down rear seat. Other options included in this boat are the rear boarding ladder, rocket launcher and the Nyalic coatings on the pontoons and transom. 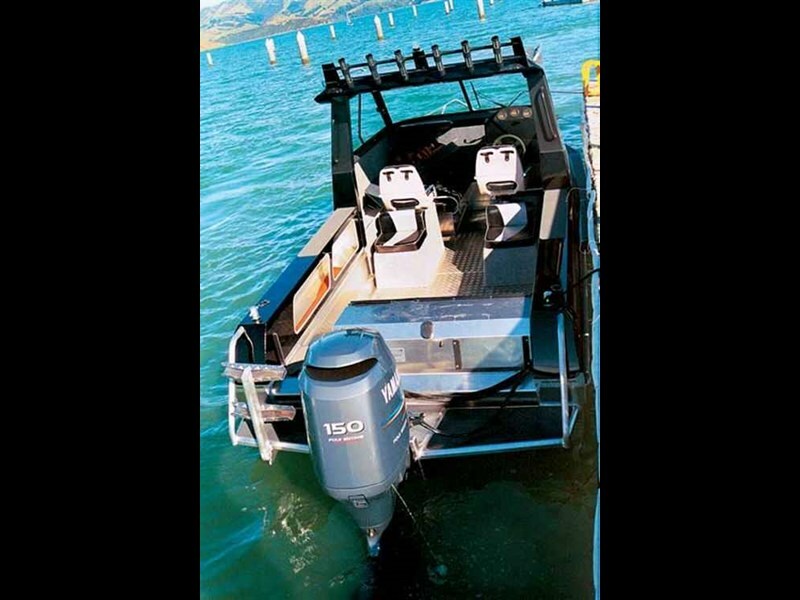 With the Yamaha F150AET four-stroke engine fitted, the boat as reviewed retails at $88,113.00 inc. GST. The base model fitted with a 150HP Yamaha Salt Water Series 2 two stroke outboard motor retails for $69995.00 inc. GST from Powerboat Centre Ltd. This represents pretty good value for money and once kitted out with a comprehensive electronics package, would make an excellent fishing machine for those blue water day trips. 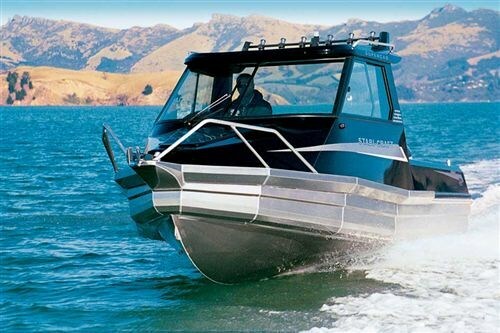 Arguably the most well-known name in the world of alloy pontoon style boats, Stabi-Craft produces a vast array of positive buoyancy craft encompassing 19 models from state of the art facilities on the outskirts of Invercargill. With morethan 700 boats built last year, Stabi-Craft Marine Ltd can claim to be one of the country’s largest boat builders by volume. While the domestic market remains the backbone of production, an increasing number of boats are being exported to markets including the USA and Australia. Boat Supplied by Powerboat Centre Ltd, 401-403 Ferry Road, Christchurch.